One of the first things I did when I arrived back in Buenos Aires was email Norma to arrange brunch. In fact, our Sunday brunch tradition is one of my new Favourite Buenos Aires Activities (tm). 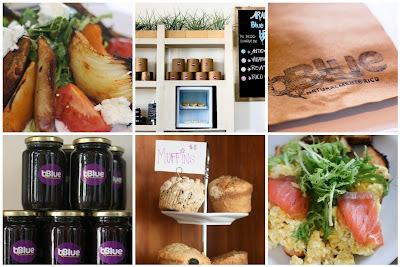 This morning we met at bBlue, one of about a zillion new organic-slash-brunch joints located in - you guessed it! - Palermo. Confusingly, bBlue's weekend menu doesn't include the same breakfast fare they offer on weekdays, however, you can order toast with scrambled eggs and smoked salmon (yes, please), and a regular lunch menu of sandwiches and salads. Happily, the aforementioned scrambled eggs bruschetta and our grilled veggie salad (with goat cheese! hooray for goat cheese!) were both delicious, and bBlue's prices are quite reasonable. As an added bonus, the coffee is strong, and I do like to kick off Sunday afternoon with a strong cup of coffee. For the record, I won't turn down a glass of Malbec, either. Where in the World is Gillian?